Hoover, I am so glad you refreshed my memory about Raven Fork. I’d forgotten that due to a very large slumping phenomenon just downstream from the bridge (they called it a catastrophic geosynclinal event with associated severe fluvial congestion), the major portion of Raven Fork is now a broad, flat, muddy stream. They call it the “mini-Mississippi,” and they’ve starting running coal barges down it, with river-runners wearing striped polo shirts poling the barges safely around the few remaining rapids. 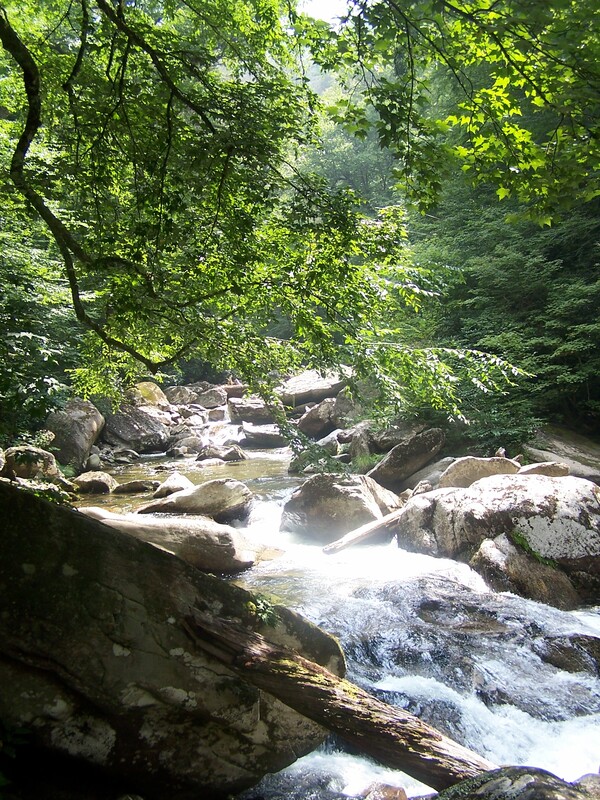 I recently wrote here about taking up the maintenance of the Enloe Creek trail as part of the Adopt-A-Trail program in the Great Smoky Mountains National Park. 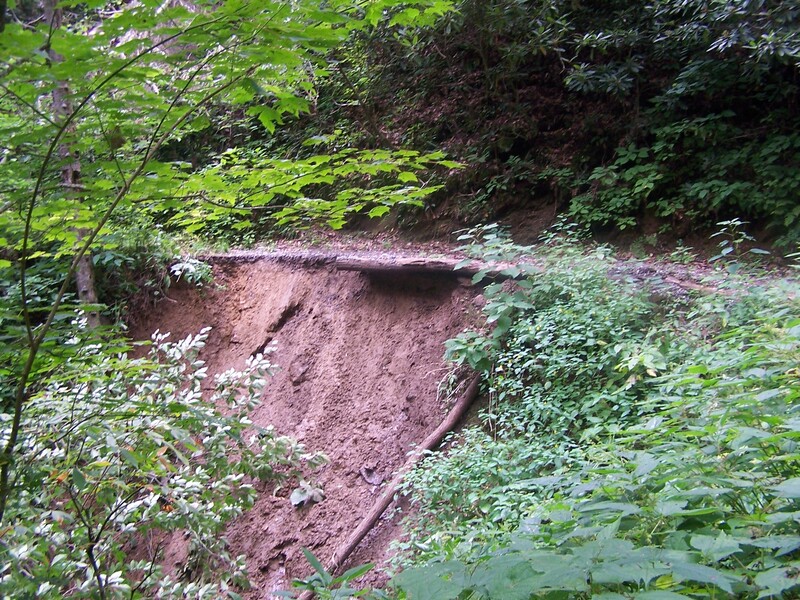 On my first visit to the trail August 9, I did a walk-through and noted problems with overgrown vegetation, a broken log bridge over Enloe Creek, an erosion problem, and a blowdown. I filed a work report with the Park Service that noted these items. 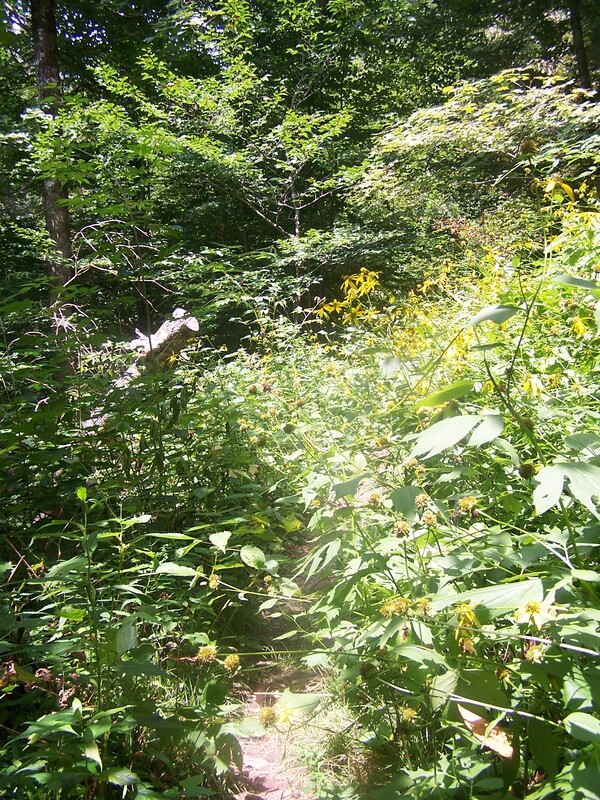 I returned to the trail August 27 with swingblade in hand to tackle the wildly luxuriant nettles and blackberries. I figured it would take several long trips to take care of the vegetation. I was curious to see if there had been any follow-up yet on the first report, but I didn’t really expect that anything had happened so quickly. The fearless leader of the Adopt-A-Trail volunteers, Christine Hoyer, had warned us that with so many miles of trail to cover, the professional crew could take a while to get to the reported problems. As I walked up the Hyatt Ridge trail to reach the start of my trail, I discovered a new problem: an absolutely huge blowdown that was hard to scramble over and difficult, on the steep slope, to get all the way around. The erosion problem was still there on the east side of the bridge. And another problem was still there—a stack of old, ugly tarps and some rusty cast-iron frying pans that had been left at campsite 47. I stopped at the bridge for a snack, noticing that just past the bridge some vegetation looked freshly cut. Interesting. When I continued on, I found that the trail had been completely weedwhacked as far as I could see, through a section that had been, well, just a little on the jungly side. Who had done this? I don’t know. I think it was most probably a Park Service crew out taking a look at the more severe problems I’d noted and doing this other work along the way. But I can’t be sure. Perhaps a reader of this blog sympathized with my overgrowth problem and decided to help anonymously! (I know, not terribly likely.) It doesn’t matter. The work is done! And the heaps of whacked vegetation continued all the way out to the trail’s terminus at Hughes Ridge. As I walked, I once again felt enthralled by the wild-looking steep ridges in this remote country—topped with giant, dark old-growth spruces that had gleaming white clouds flowing over their crests. 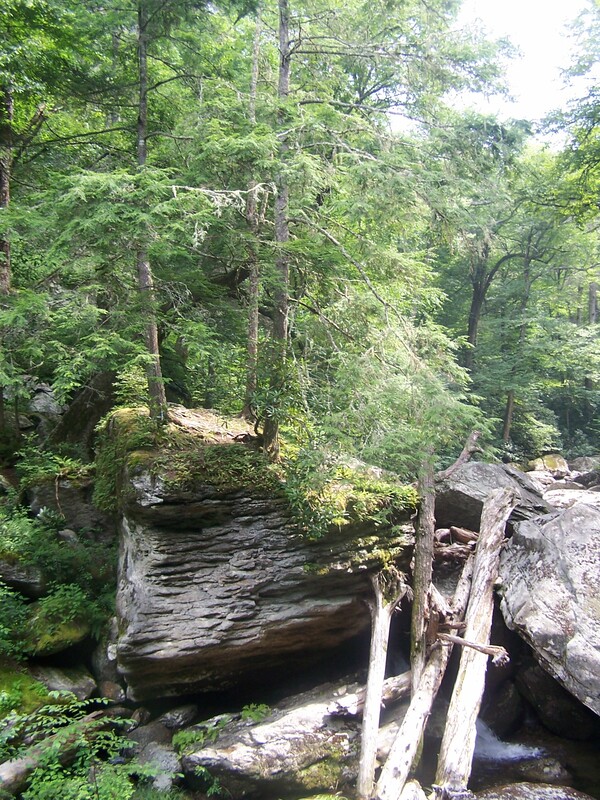 I returned, stopped again at Raven Fork, this time finally noticing the interesting circumstance that the three hemlocks growing out of the top of the enormous cube-shaped boulder by the bridge looked very healthy, when nearly all others are now dead. I looked more closely and observed that each of the three had an inconspicuous blue paint mark. The Park Service had decided that these were so important and conspicuous that they deserved special treatment against the hemlock woolly adelgid. On the east side of the bridge, the anonymous gnomes had left some vegetation for me to cut back with my swingblade. I was just as glad—after all, I wanted to feel I was contributing something! So I whacked my way up to the Hyatt Ridge junction. Soon after that I encountered a guy on horseback leading a packhorse. He greeted me and mentioned that he was in there to remove the junk from the campsite! He and his buddy further back were “VIPs,” or Volunteers in the Park, people who can be on call to help out at varying locations. The Park Service had told them that someone had reported the problem at the campsite… that must have been my work report! Sometimes things actually go the way they’re supposed to. I felt strangely happy as I got back to the car and drove down the Straight Fork road and into the Big Cove: another reason I like my trail section, getting up into the far end of the Qualla (Cherokee) reservation. This is another post related to my upcoming trip to South Africa. I will depart September 19. Two monuments have been erected to the Afrikaans language. This seems striking to me. Is there anywhere in the world a monument to the English language in and of itself, despite the exponentially larger number of English speakers than Afrikaans speakers? The existence of these monuments has of course a historic and symbolic significance. Afrikaans was long considered an illegitimate child of Dutch, spoken only by people considered to be ignorant, somewhere off in the veld of southern Africa. 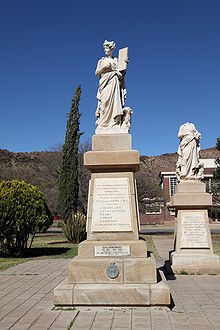 The monument pictured above was created in 1893, or six years before the start of the Boer War, in the town of Burgersdorp. The interesting thing about Burgersdorp is that it is a town in the former Cape Colony (already part of the British Empire as Britain went to war with the Boers), but very close to the border with the Orange Free State, and inhabited largely by people of Dutch descent. Although subjects of the Empire, their sympathies lay largely with their near neighbors who were of similar descent but citizens of an independent republic (until the British took it over) rather than subjects of Queen Victoria. As a result, residents of Burgersdorp were particularly tempted to become “Cape rebels,” risking imprisonment or execution if they provided assistance to the Boers. This monument, as it has existed since 1939, presents a very unusual dual vision. It consists of a statue of a woman pointing her finger at a book that she holds. The statue was beheaded sometime during the Boer War, and the British, as the victors, simply had the remains of it removed and stored away. As relations between Britain and South Africa gradually softened after the war, the statue was replaced by a replica that depicted a similar woman pointing at a book, with her head still on. In 1939, the beheaded original was discovered, and it was placed beside the replica. There are a lot of subtexts in this side-by-side placement. To me, the major message is: They tried to destroy us, but they did not succeed. 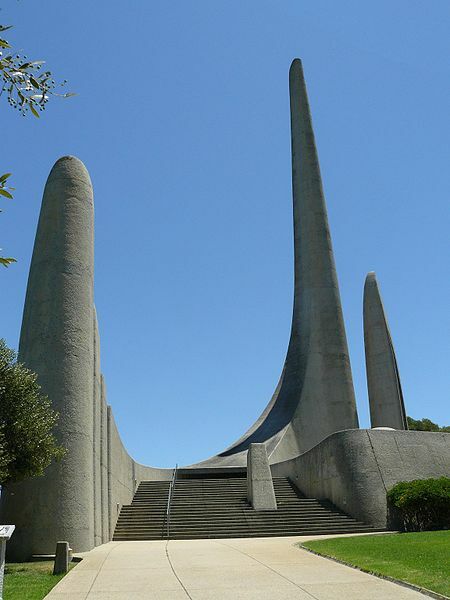 In 1975, another, very different, monument was erected to the Afrikaans language, in Paarl, not far from Cape Town. It commemorates the 50th anniversary of the occasion when Afrikaans, as opposed to Dutch, was declared an official language of South Africa. It was also erected on the 100th anniversary of the creation of the Genootskap van Regte Afrikaners (Society of Real Afrikaners), an organization celebrating the distinct identity of the Afrikaners. But I am having a terrible problem. There is a particular sound in Afrikaans that I cannot for the life of me get right. It is the “G” sound, which is pronounced with a kind of extra mini-explosion of air—but this is not (as I read somewhere) that “weird Arab thing that you do in your throat.” It is the sound that you hear at the end of the Scottish word “loch.” For some reason, I can make a halfway plausible approximation of the sound if it comes at the end of the word (as in “loch”), but not if it comes at the beginning. I will just have to keep practicing, I can see. Here is a picture of that second Afrikaans language monument. I do like the inscription, “DIT ONS ERNS,” which is said to mean “We are earnest about this” or “This is our earnestness,” but I don’t like the monument itself. Once again, I have no photos of my own from a hike—the ones you see here were either taken on previous occasions or borrowed from Seneca, one of our party. I blame it all on Brian Reed. I’ve hiked with him twice, and each time the camera I had with me was destroyed by water. You’d think I’d learn a lesson here. 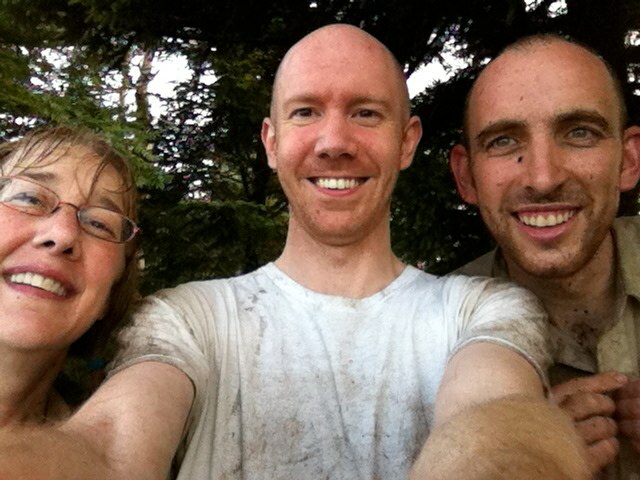 I thank Seneca for this photo of the three of us added on—taken at the top of the Jumpoff. The forecast called for the same we’ve had for weeks now: warm and muggy with afternoon thundershowers. It turned out completely different—cool temps with continuous solid rain from when we started hiking at 8:00 from Newfound Gap until the early afternoon. 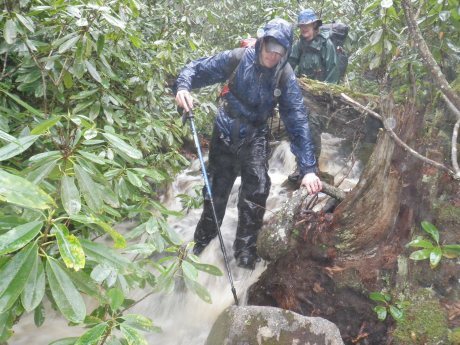 The rain created a magical world of tumbling cascades and surging streams up in the very wild headwaters of Lester Prong. Our party of adventurers consisted of Seneca Pressley, Brian Reed, and myself. As we climbed out of the saddle to the summit of Horseshoe Mountain (5288′), the woods opened up a bit. We got our first glimpse of our intended route down, a long slide that runs from the summit all the way down to Lester Prong. Some friends of mine have been down the slide, which has an interesting quartz boulder in it near the top. But we could not see the boulder, because it was submerged in a giant cascade of tumbling water. You can just make out the very top of the slide below the high point on Horseshoe Mountain. 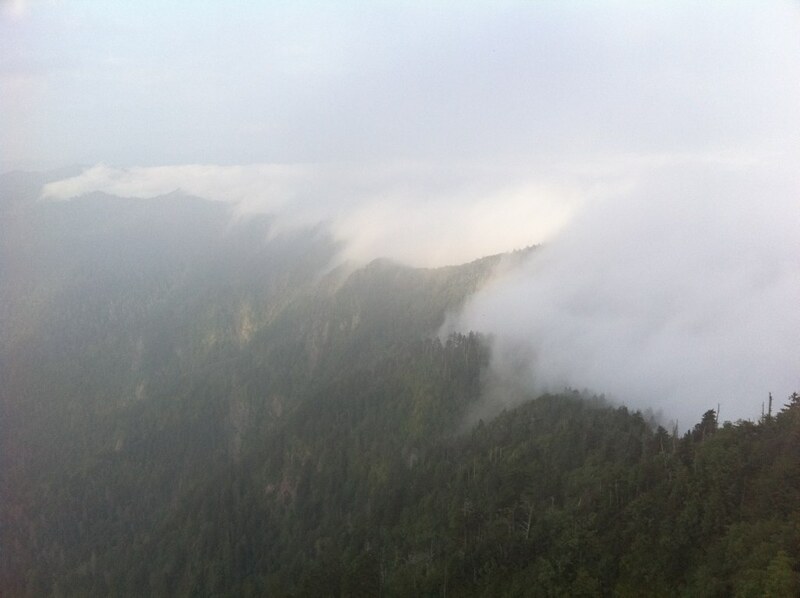 Taken from Tourist Bunion. 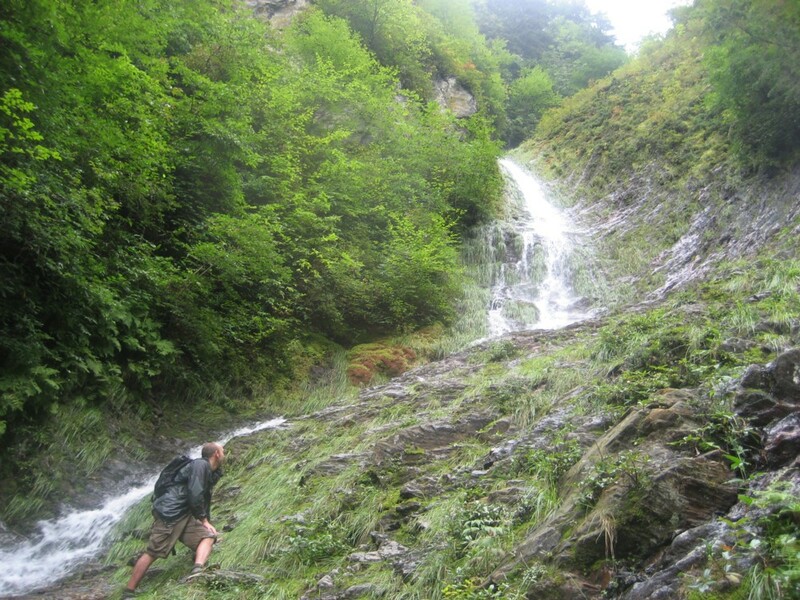 It did not look feasible to go down the upper slide in this heavy flow of water, so we descended a few hundred vertical feet through woods beside it until the grade lessened enough to make it doable. We waded down ankle- and sometimes knee-deep water along this wonderful secret passageway that can only be seen from a few spots (the best spot to see it is from the “real Bunion,” but I didn’t take a picture of it from there, darn it!). Walls of thriving green vegetation hemmed us in. Long before we reached the valley of Lester Prong, we could hear it rampaging along. When we finally reached the valley floor, we hunted around for walking sticks to help us keep our footing as we waded up the stream—for it would definitely be a wade. The conditions reminded me of the descent of a tributary of Eagle Rocks Prong that I did with Brian and three others last fall, coming off the south side of Woolly Tops (this is where the other camera was submerged). Brian contemplates the stream. Taken last fall in tributary of Eagle Rocks Prong. This time we were going upstream rather than downstream. It was the first time I’d been up past the second tributary of Lester Prong since an SMHC outing in the 80s. 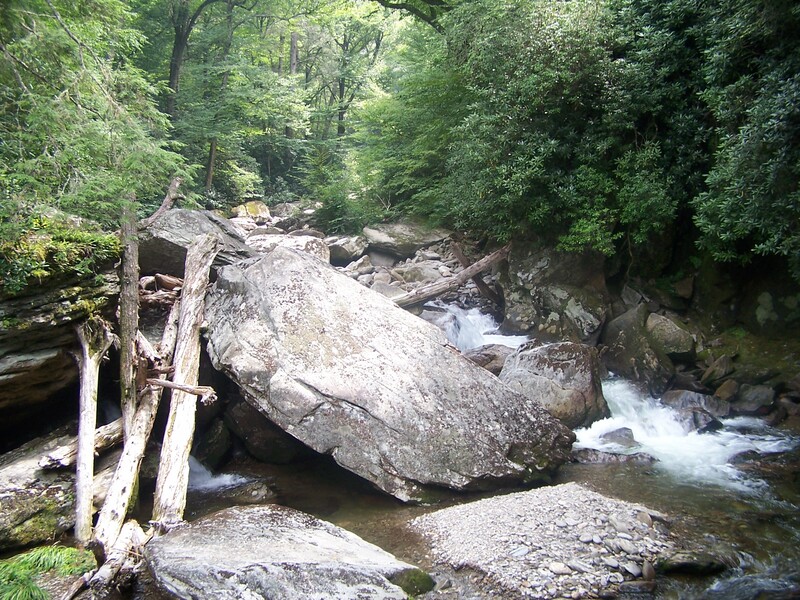 We’d hiked it the day after a notable flash flood that scoured out the nearby valley of the east fork of Porters Creek. But on that trip, we had still been able to rockhop rather than wade. This time, there was no alternative to wading. We stayed to the shallower water and the edges wherever we could, but at times had to wade through waist-deep water. It was an enthralling adventure, fighting our way up this remarkable stream, clambering over wet, mossy boulders, stepping into rushing water without being able to tell ahead of time how deep it was going to be. The whole upper stream looked different to me from the way I’d remembered it from the SMHC trip, both because of the high water and because this is a steep-sided valley that is constantly rearranged by violent rainstorms that deposit massive logjams and piles of boulders in ever-changing patterns. At last we reached a critical junction at 4600′. To the right lay the main flow of Lester Prong that leads up to the junction of the Horseshoe and Boulevard leads. To the left lay a side stream that leads directly to the steepest part of the Jumpoff. Both of these branches make long cascades at this point as they tumble down over very steep Anakeesta rock, the lefthand cascade being the taller and more impressive from this viewpoint. 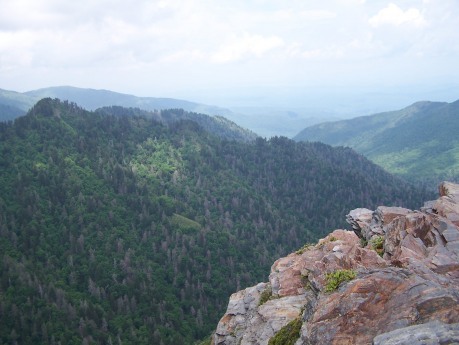 From here to the top of the Jumpoff, it is a climb of 1400 vertical feet in a distance of well under half a mile. I climbed up next to the more southwesterly cascade and continued up the draw nearly to the Horseshoe/Boulevard junction, and here I made a mistake based on what must have been an incorrect recollection from the SMHC trip. I angled to the right and ran into a cliff band between 5200 and 5400 feet. It took me a while to find the weak points in the bluffs and to pull myself up using branches of rhodo for the most part, which were fortunately fairly plentiful. But I made it to the top, and I reached the Jumpoff overlook about ten minutes before Brian and Seneca did. They came up what I now estimate to be less than 50 feet north of the steepest point of the overlook. Brian had enjoyed it, while Seneca looked a bit pale from the experience, but he had made it. In the last, nearly vertical 100 feet or so, they had used a widely spaced series of five young spruce trees to create the links in their route. Brian said that if even one of those five spruces had not been there, they couldn’t have done it. They lunged upward for each one in turn and did huge pullups to get their bodies up to that tree, and then on to the next one and up the face. Brian e-mailed me later to say that he thought there was another route that was more doable—he felt that by making a traverse further to the right (north), I could consider it feasible for doing myself. I do know that I never would have made it by their route, which certainly went into wilds of Narnia! We watched an interesting swath of cloud streaming over the back of the stateline ridge, cloaking the crags and ridges of the Bunion area. 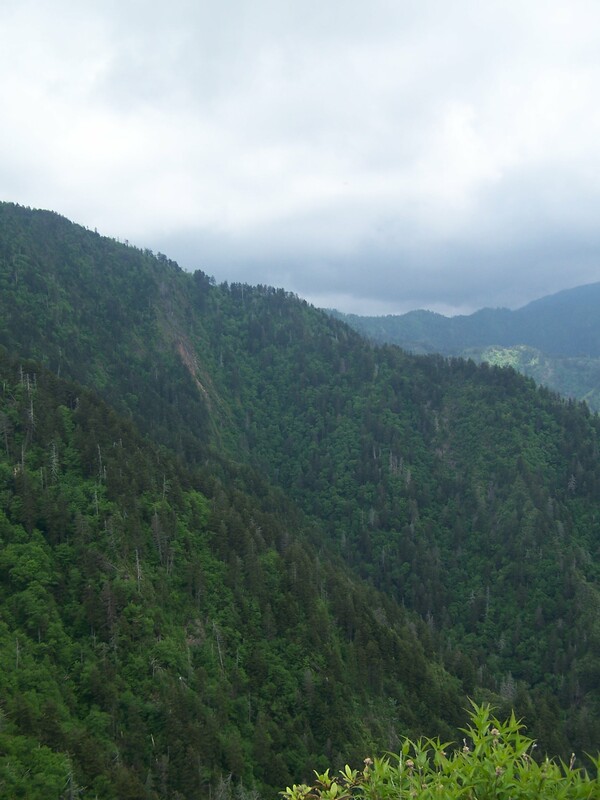 Then we headed back out by trail and got out to Newfound Gap just about twelve hours after we started. Of that total time, it took us two hours to do six miles by trail and ten hours to do no more than two miles off-trail. Here is a beautiful photo from Seneca that shows the clouds flowing over the stateline ridge. Clouds over stateline ridge. Photo by Seneca. And below is another photo from last fall’s venture down Eagle Rocks Prong. I am including this only so that people will understand what these streams are like.